Measurements taken at Mauna Loa Hawaii. Annual numbers derived by averaging daily measurements for each year. Note: Missing days from the source data file are filled by propagating previous readings or averaging nearby data to obtain the average figure. The overall data image presented here should be very close to reality. The increase in Methane has been generally ongoing since records have been kept starting in 1987 except for a lull in the early 2000's. Current levels are unprecedented going back over 400 thousand years. March 5, 2019: The 2018 charts are up. Methane levels increased for the 12th year in a row although the amount of increase has decreased for the third year in a row. While the annual CO2 equivalence of Methane emissions is currently about a quarter of CO2, the fear is as oceans continue to warm and tundras melt a feedback loop will be triggered which will cause run-away massive levels of trapped Methane to escape into the atmosphere causing huge ecological changes which could bring about mass extinctions, including our own. So far, the worrisome uptrend in Methane levels which resumed in 2007 has been linear. 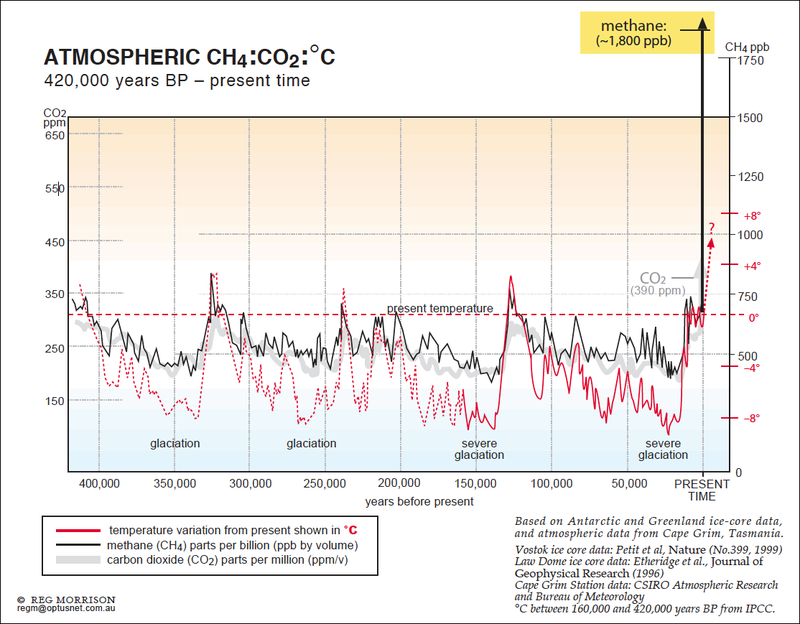 Rather than wait for tipping point acceleration in the trend line, increased world wide action is required at an extraordinary level to turn these graphs of CO2 and Methane levels to the down side. For the preliminary data bar chart for 2017, shown earlier in the year, I assumed that the extreme outlier datum for November 20, 2017 was a preliminary-data error and for that value used the average value of the day before and after when computing the year's average figure, trimming the annual figure by about 0.30. The day figure was 2006.73. Upon inquiry about this outlier, the early indication is that this datum is real, that a "really strong, fast transport from Asia, up to Alaska, then down to MLO" (Mauna Loa Observatory) brought in "strong Asian emissions combined with the effect of the N/S latitude gradient". The intensity of this event was a very rare event as there nothing else in the full daily record which comes close to this (there are a couple dozen days or so when the values have been within the 1900-1920 range, all in the past two years). In the final bar chart this value was included when figuring the annual average. NASA provided me with an air flow trace-back diagram illustrating the origins of the air sampled many times during the day before, the day and the day after the 2006.73 reading of November 20. Very cool! !